JANUARY 16, 2013 -- The Hudson River Natural Resource Trustees, including NOAA, released a report today outlining the magnitude of toxic chemical pollution in New York's Hudson River. The report, "PCB Contamination of the Hudson River Ecosystem" [PDF], documents six years of data and analysis showing that the Hudson River, for more than 200 miles below Hudson Falls, N.Y., is extensively contaminated with polychlorinated biphenyls (PCBs). Starting in 1947 and for approximately 30 years, manufacturing plants operated by General Electric Company (GE) discharged PCBs into the upper Hudson River, with additional releases of PCBs occurring as well. According to the report, PCBs are a "group of highly toxic compounds that are known to cause cancer, birth defects, reproductive dysfunction, growth impairment, behavioral changes, hormonal imbalances, damage to the developing brain, and increased susceptibility to disease in animals." Hazardous at even very low levels, they make their way up the food chain and become stored in the tissues of wildlife and fish, posing a health threat if people consume them. Analysis of the river from 2002 to 2008 shows that PCBs permeate nearly every part of the river: surface waters, sediments, floodplain soils, fish, birds, wildlife, and other natural resources. The report further documents decades of high levels of PCBs and likely harmful effects on living organisms exposed to the contamination in the Hudson River. 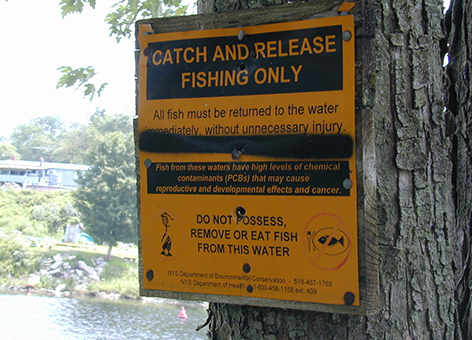 PCB levels in fish were often 10 or more times the U.S. Food and Drug Administration's (FDA) standards for safe consumption (p. 10) and in water samples tested "10 to 10,000 times higher than that deemed safe for aquatic life, fish-eating wildlife and human consumers of fish" (p. 5). As a result of this pollution, the public has lost the use of these natural resources, for example, due to restrictions and advisories for catching and eating fish and navigational losses due to contamination of the Champlain Canal. A Hudson River PCB Forum also was held on January 16, 2013 at Marist College in Poughkeepsie, N.Y. The intent of the forum was to provide mid-Hudson communities with an update on the PCB dredging project and restoration planning by the Natural Resource Trustees.